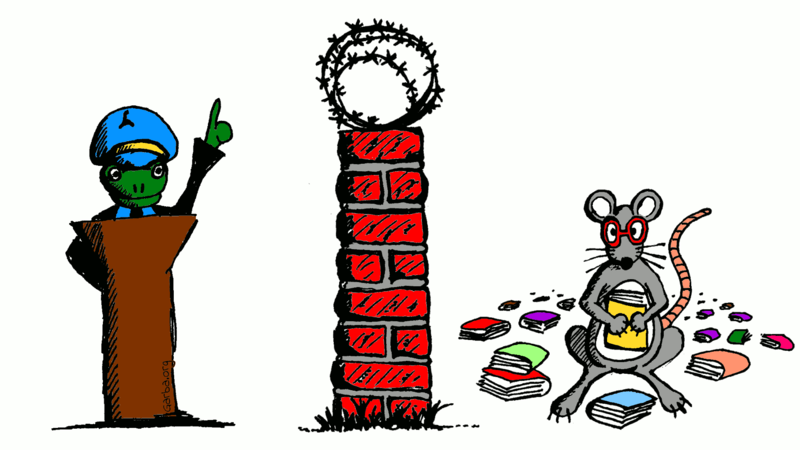 The Command and Query Responsibility Segregation (CQRS) Pattern is a solution to the problems that are inherent to the Create, Read, Update and Delete (CRUD) approach to data handling. We use Haskell to explore the problem scope and proposed solution described by the pattern. The Command and Query Responsibility Segregation (CQRS) Pattern is described by Homer et al. (2014, p. 42) and Fowler (2011), based on the work by Young (2010), as a solution to the problems1 that are inherent to the Create, Read, Update and Delete (CRUD)2 approach to data handling. Unlike many patterns that answer to general business or engineering problems, the CQRS pattern is an alternative to the another pattern, CRUD, due its various claimed shortcomings. In more concrete terms, it is CRUD in the way it is commonly implemented in Object-Oriented Languages (OOP), involving the use of Data Transfer Objects (DTOs) (Homer et al., 2014, p. 42) and Object Relational Mapping (ORM) technology (Young, 2010, p. 6) such as Hibernate3 or Entity Framework4. In this article, we will examine whether the problem identified by the pattern as well as the suggested solution is applicable to a functional programming language like Haskell. 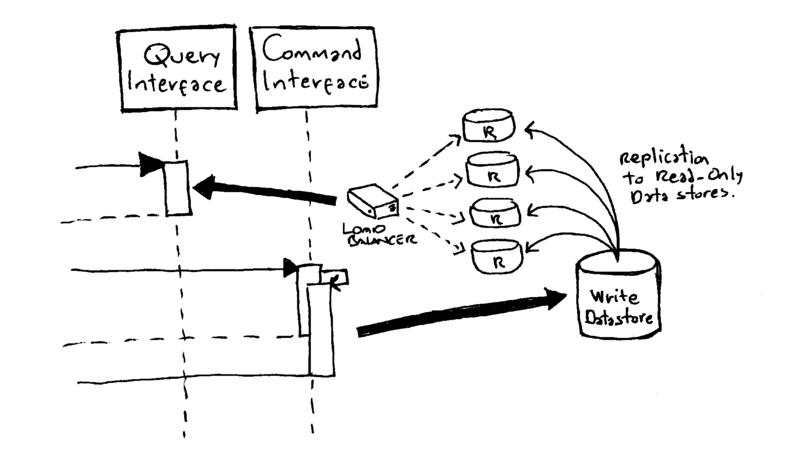 For simplicity, we ignore Event Sourcing (Fowler, 2005) as the default “backend” implementation for CQRS. This pattern is based on the shortcomings that emerge from what Young (2010, p. 2) calls a “Stereotypical Architecture” which typically implements the CRUD paradigm using Data Transfer Objects (DTOs) to represent both retrieved data as well as data to be changed. A stereotypical architecture using the CRUD/DTO approach. The main issue, though, is conceptual (the use of a single model for both read and write operations) and not necessarily exclusive to imperative OOP languages. Let’s consider an example by representing an order consisting of line items using the record syntax in Haskell. Nothing      -> "Order Id missing"
Why is the code so verbose? Because the orderId and lastUpdate fields are of type Maybe since they may be potentially empty. One can argue that the orderRead function should guarantee that an Order value is always “correctly” populated; an exception should be thrown if this not the case. Likewise, we already know the value of orderId (456). The point is, though, that simply applying fromJust to an Order’s field, in the belief that it was generated by the right function, is an accident waiting to happen. Thus, bullet-proof code should contemplate the possibility that the value under consideration may not have originated from the correct function. In the above example, we first create an Order value and obtain its orderId, and then use it to create a LineItem value separately. Note in this case, unlike that of read code we had contemplated before, we have to set the orderId and lastUpdate fields to Nothing. The entire procedure is wrapped by the transactionWrapper function that creates the appropriate context for the underlying data store. Note in the above code that the parentOrderId is now set to Nothing as opposed to the previous version. This is, in a nutshell, the main issue surrounding the CRUD/DTO paradigm; however, this example may not be sufficient to discredit it yet. Let’s look at a more real-world use case in which we are asked to produce a report of customer names and their purchased items based on a given price. Let’s say that the manager wants to know who are the “stingy” customers who buy items priced at £3.50. In order to produce the above report, a function is required to “navigate” the result produced by readPrice. putStr " - Item: "
0 -> putStrLn "No items found"
_ -> putStrLn "Multiple items found"
Again, we come across verbose code for something which should be fairly trivial. The above code iterates through a list of orders and extracts the customer’s name and the item’s description from each LineItem value associated with an Order value. customerName = (customerName o) ++ " Stingy"
_     -> putStrLn "No orders found"
Populate the Order value with all the fields that make it compatible with the Create context. This can only work if LineItem values are updated independently from Order since the readByPrice function only returns one LineItem value per Order value. Modify readByPrice so that it returns at least orderId and then obtain a new complete Order value using the orderRead function. For the second strategy, this is what the code would like like—please note the dangerous fromJust application on orderId and how easy it is to mistake o' (primed version) for o. 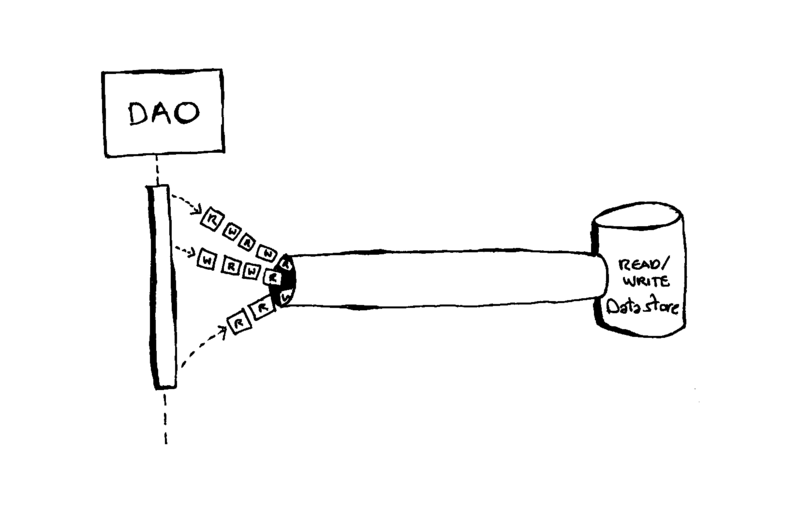 In the typical CRUD/DTO approach, read and write operations share the same pipe. Data access contention: when multiple actors operate in parallel on the same data and different locking strategies are employed. Problematic one-size fits all optimisation: both read and write operations are impacted by the same performance constraints since they both share the same physical access pipe. As the pattern’s name suggests, the solution is to segregate the write (command) from the read (query) operations. An example of a controller interacting with Command and Query interfaces. Let’s start with the query functions. In the below example we return views as tuples which make it easier to create ad-hoc projections. For example, the orderQuerySummarised function returns a succinct summary in which the line items have been summed to produce a total price whereas orderQueryFull returns the full order with a list of line items. We can immediately see how this model is more efficient than the CRUD one since it eliminates the redundancies associated with DTOs. However, Homer et al. (2014, p. 43) note: “one disadvantage is that, unlike CRUD designs, CQRS code cannot automatically be generated by using scaffold mechanisms”. Indeed, a framework like Persistence, could not anticipate what specific queries the programmer had in mind. For example, the OrderUpdateName command only changes the order’s customer name whereas OrderUpdateFull also replaces the order’s line items. An interesting property of the command approach is that we can easily process a list of commands rather than creating a specific function for each command since they are disconnected from the query model. Note: An ideal CQRS implementation would return the commands’ events in an asynchronous, non-blocking fashion. This model simply aims to illustrate the pattern’s functional implication. Note also that these events represent the commands’ outcomes and are not to be confused with events for the purpose of implementing the Event Sourcing pattern. OrderDeleteFailed orderId -> "Could not delete: "
OrderUpdateFailed orderId -> "Could not update: "
The CQRS pattern not only suggests that data should be handled using a different set of application-level functions but that it also should be segregated in terms of different read and write physical stores (Homer et al., 2014, pp. 44–45). For example, there may be a single “write” node which replicates to four “read” nodes that are used by the query functions. 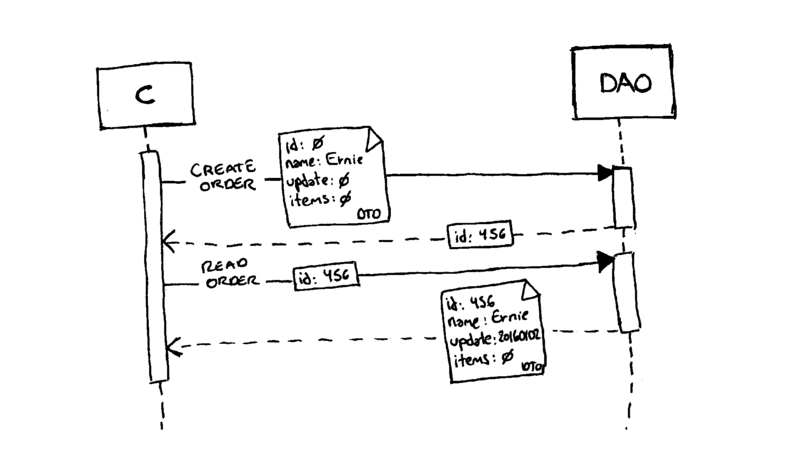 In more complex scenarios, nodes may be deployed to host only specific subsets of read data. 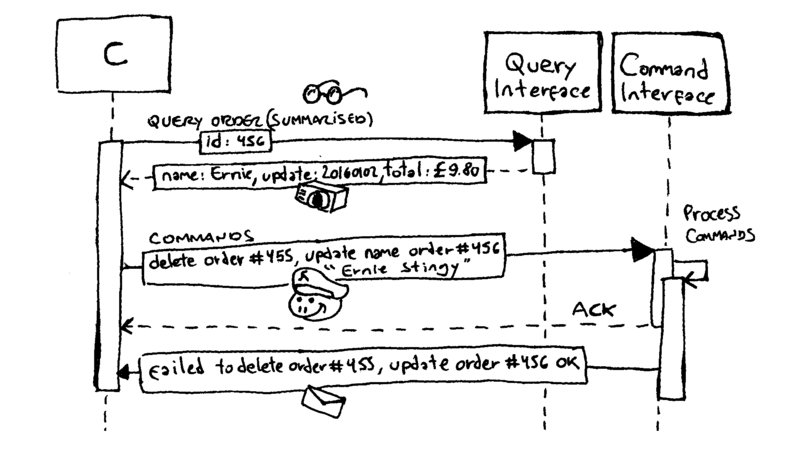 An example showing a potential physical implementation of the Command and Query Interfaces. Complexity raised by different write and read data stores: In most cases, the division of write and read data stores implies the use of an “eventual consistency” approach to transactions which increases an application’s design complexity. CQRS is not a one-size fits all approach: CRUD and CQRS may co-exist. For example, CRUD may be used for trivial use-cases whereas the CQRS may be used for uses cases in which high scalability is the driving factor. It is customary to implement CQRS using the Event Sourcing patern: It is likely that Homer et al. (2014) imply that simply wrapping CQRS functions on top of a conventional traditional SQL database is not necessary the preferable approach. Instead, CQRS is normally implemented alongside the Event Sourcing pattern (Homer et al., 2014, p. 50). Collaborative versus simple domains: Homer et al. (2014, p. 45) suggest that the CQRS pattern is mainly applicable to complex collaborative domains in which multiple operations are performed in parallel on the same data and specific read and write optimisation may be required. The pattern may not be suitable in situations in which “the domain or the business rules are simple”. We also have to note that the tuple-based approach used in this article’s example comes with a significant drawback: a single change to the logical entity handled by both the queries and commands results in several changes both on the provider and consumer sides. The problem identified by the CQRS pattern, embodied by the traditional CRUD/DTO approach to data handling, seems to be also relevant to a functional programming like Haskell when representing entities using the record syntax. The author’s final conclusion is that the CQRS pattern does not “replace” CRUD/DTO, but offers, instead, an alternative when scalability and complex update and query scenarios render said traditional pattern inappropriate. Please also note that in this article we ignore Event Sourcing (ES) which is commonly used in conjunction with CQRS. The pattern is in fact many times referred to as CQRS/ES. Homer, A., Sharp, J., Brader, L., Narumoto, M., Swanson, T., 2014. Cloud Design Patterns: Prescriptive Architecture Guidance for Cloud Applications. Microsoft.